EXIF info - Aperture : ƒ/14 | Camera : Canon EOS 5D Mark II | Taken : 26 September, 2010 | Flash fired : yes | Focal length : 100mm | ISO : 100 | Location : 12° 55′ 20.02656″ N 74° 51′ 55.209240040174″ E | Shutter speed : 1/125s | Images and content Copyright © Krishna Mohan. Please contact me to purchase prints or for image publication license. 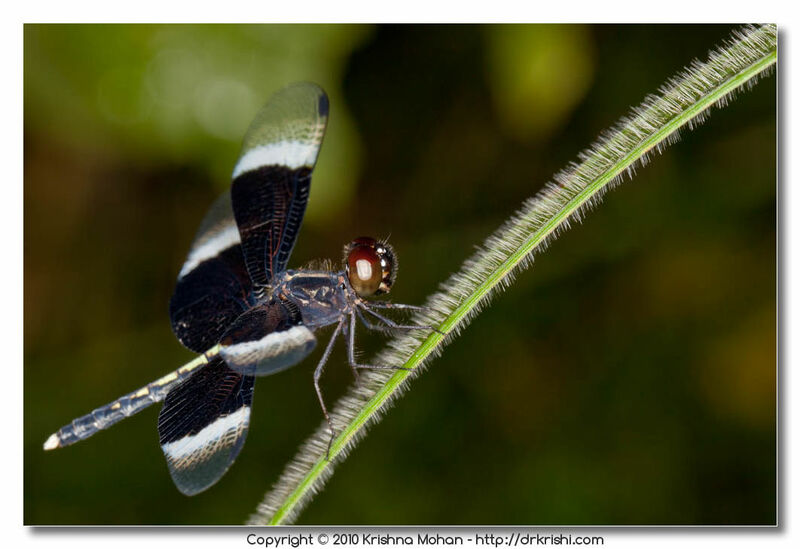 I found this Male Pied Paddy Skimmer(Neurothemis tullia) dragonfly on a late evening. I tried shooting him with my 300mm f 2.8 lens thinking that he will fly off if I approach closer. The results of 300mm were not good as light had faded and I had to resort for a shallower depth of field or higher ISO both of which are detrimental to the quality of macro. So I ran quickly to my car and picked the macro rig and came back hoping he will still be there waiting for me. He did not disappoint me. 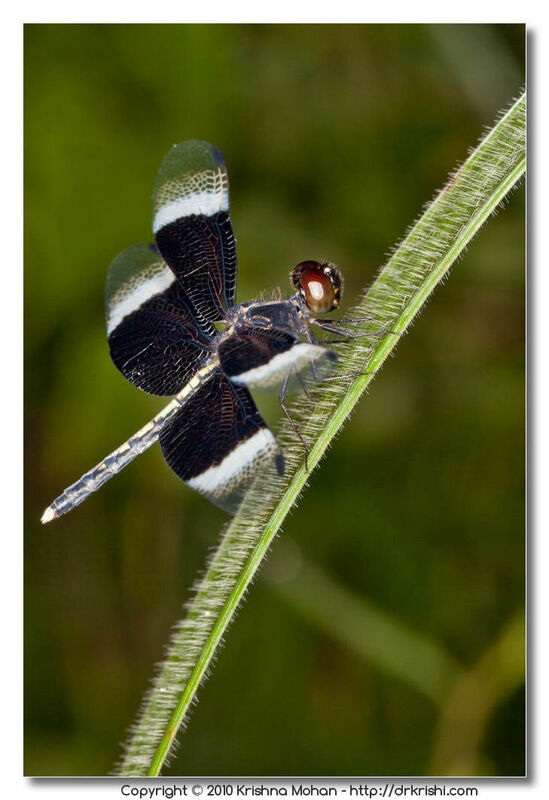 The Dragonfly was still perched on grass blade. I had ample time to position myself and use my Canon EOS 5D mark II with Canon EF 100mm f/2.8L Macro IS USM fitted with Ray Flash Adapter on a Canon Speedlite 580EX II flash. I was not able to reach front of him as there was a big trench with lot of weeds. So I was not able to get frontal image. Otherwise it was a very pleasant shooting. Breeze was calm on that evening, which helped me to critically focus on the dragonfly. F/14 aperture I used gave a great depth of field which nicely highlights the hairs on the dragonfly as well as the grass. 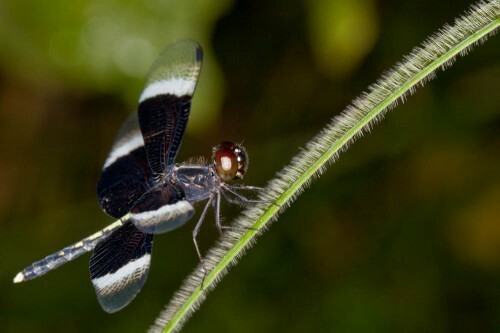 The Pied Paddy Skimmer (Neurothemis tullia) is a species of dragonfly Distributeed throughout the Oriental region and found in south and south-east Asia. It appears in Bangladesh, China, Hong Kong, India, Malaysia (Peninsular Malaysia), Myanmar, Nepal, Sri Lanka, Taiwan, Thailand, and Viet Nam. Male has a black face. Eyes are blackish brown above, violaceous below. Thorax is black with mid-dorsal creamish white stripe. Legs are black. Basal half of wing is opaque blue black which is bordered by a milky white patch towards the tip. 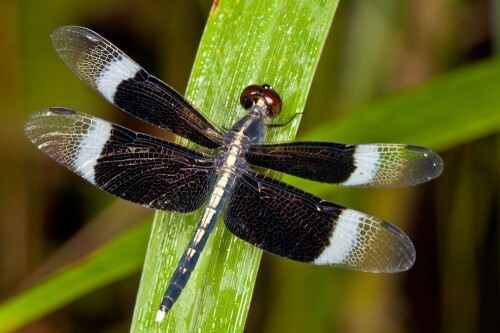 The wing tips are transparent with a dull brown wing spot. 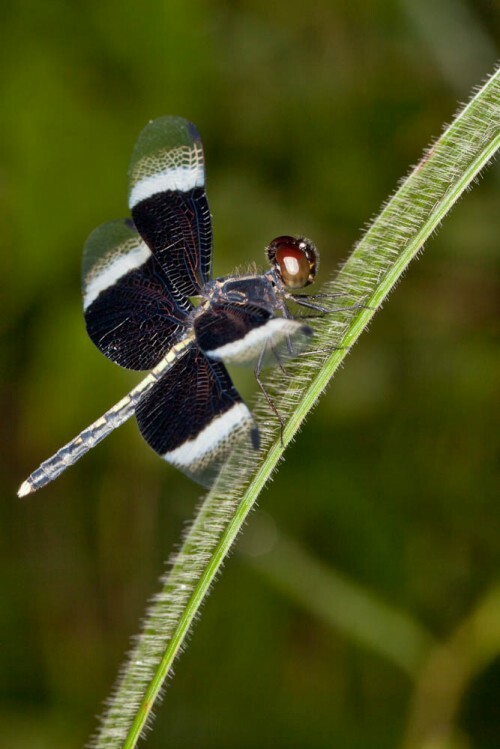 Abdomen is black with a broad mid-dorsal creamy white stripe on the upper side. 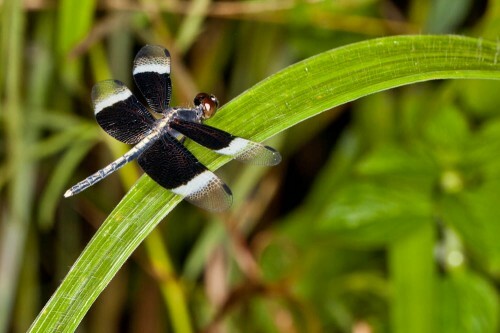 Female differs significantly from the male in body markings and coloration. The face is olivaceous yellow. Eyes are pale brown above, which fade to pale olivaceous towards the sides and below. Thorax is greenish yellow with a bright yellow mid dorsal stripe. This stripe is broadly bordered with blackish brown throughout. The outer surface of legs is yellow and the inner surface is black. Base of the wings bright amber yellow. Front edge of the wing is blackish brown, broadening into a very large blackish brown spot. This spot extend to the rear edge of the wing. In hind-wings this spot is irregular or sickle shaped. 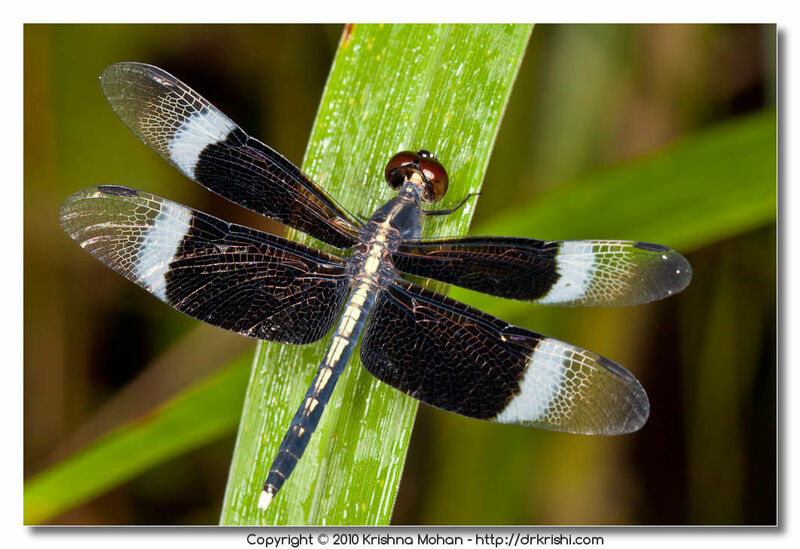 Tips of all wings are broadly blackish brown. Wing spot is dull brown. Abdomen is bright yellow with a broad black band above. Underside is black. 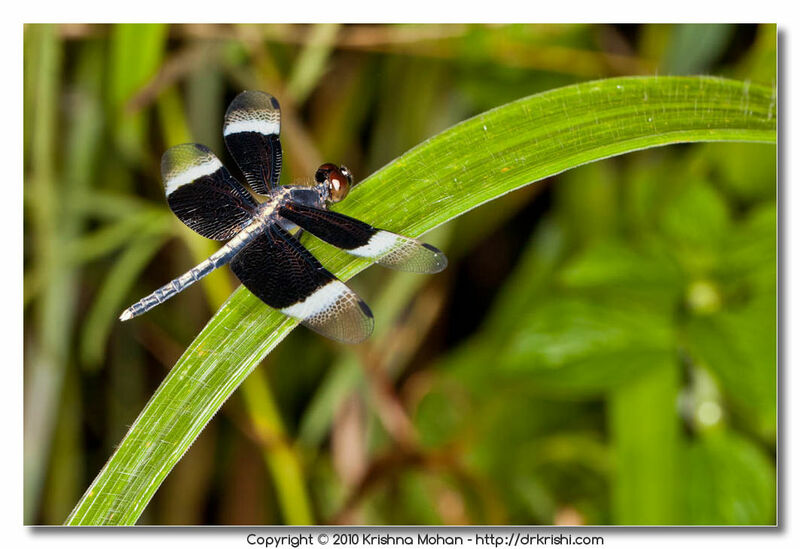 It is a conspicuous species of ponds, marshes and paddy fields. Flight is slow and weak. Usually perches on twigs, aquatic weeds and other plants. This species is very common along irrigation canals in paddy fields. Breeds in marshes and ponds. Flight season: Found throughout the year. However, peak abundance is during July-September months. What do these feed on ? ಬತ್ತ ತೆನೆ ಕಚ್ಚುವ ಸಮಯದಲ್ಲಿ, ಕಾಳಿನ ರಸ ಹೀರಿ ಜಳ್ಳಾಗಿಸುವ ಕೀಟಗಳ ಪಡೆಯಲ್ಲಿ, ಇವೂ ಭಾಗಿಗಳಲ್ಲವೇ ? Very nice shots doc, the green background beautifully complements the shot. The tree bark DF was sitting on , in your previous post, was kinda doesn’t felt good. Especially liked the way the hairs on the leave turned out in 3rd shot. There seems to be similar kinda hair on the thorax.